SOME OF THIS…SOME OF THAT! Weather – A bit chilly and cool this past week. Mostly sunny skies in the mid-70s, but also some spotty rain showers here and there. Depends where you were. Fishing – Quite a variety of fish. Hard to tell really when there’s not many folks fishing this time of year. However, the folks that did get out fishing did OK with some decent catches. Type of Fish Caught This Week – small roosterfish, dorado, snapper, cabrilla, amberjack, bonito, needlefish, jack crevalle, small yellowtail. Forecast – Actually some rain possibilities early in the week but hard to know where it will fall. La Paz encompasses alot of area. Rest of the week will be partially cloudy with highs in the mid-70’s down to the upper 50’s/ low 60’s. 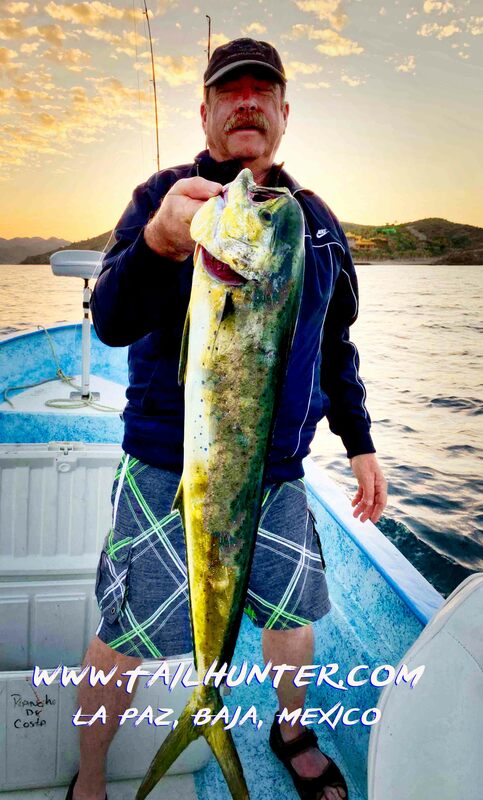 Ken Ward from Alaska probably doesn’t get a chance to wear those great shorts very often, but he also doesn’t catch any dorado up there either like this nice one just outside of Bahia Muertos where he was staying at Rancho Costa. Actually, a nice sunset bite! 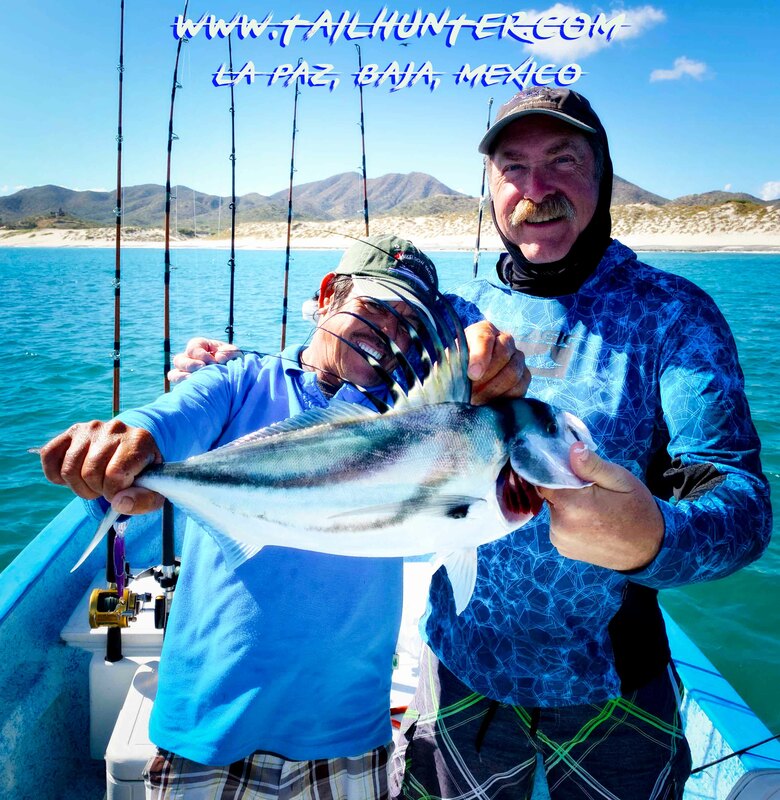 Fun on the trout rods right in Bahia Muertos on feisty baby roosterfish. Ken got this and released it. Some beautiful patterns on these nice cabrilla that make great eating for Steve Greer visiting from Wyoming. 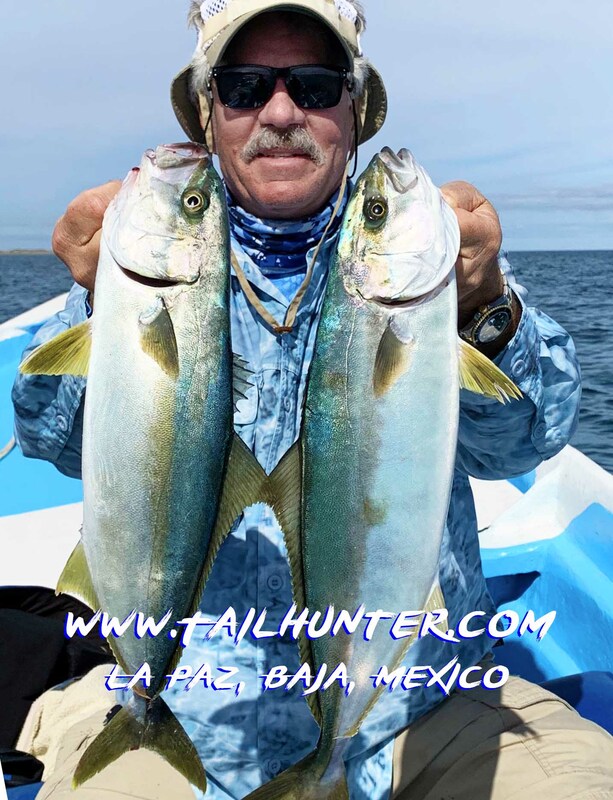 El Jefe himself, Gary Wagner, owner of Rancho Costa in Bahia Muertos near La Paz with a couple of tasty firecracker yellowtail. While Ken has another rooster bending his mini-rod, Chuck Chandler poses with another roosterfish. All roosters were released. Some good eating! 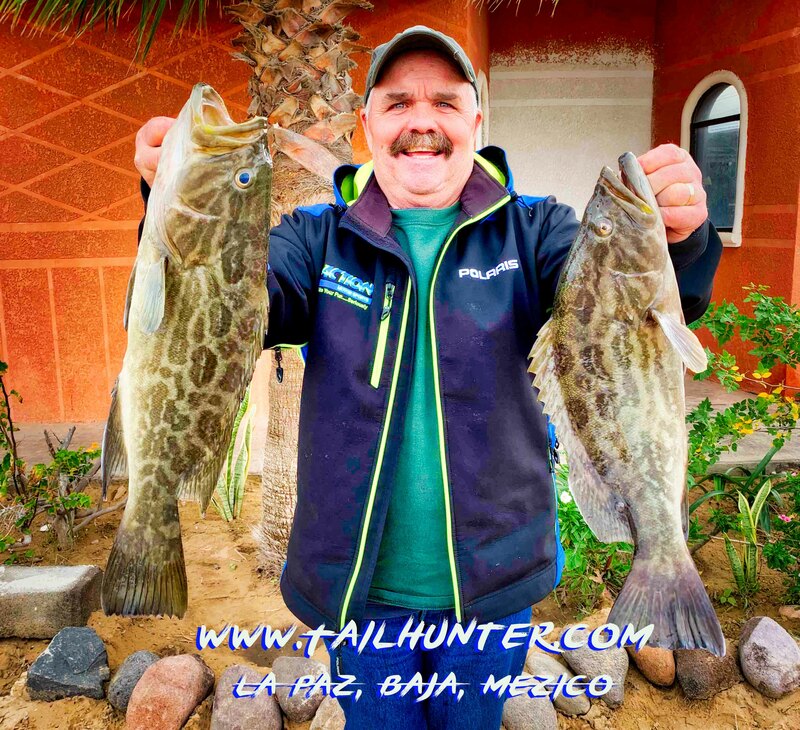 Mic Ward poses with a cabrilla and small amberjack some of the best cold water fish this time of year. Not a whole lot happening this past week to be honest. It was a bit cold and chilly and not a lot of folks on the water as we hit that lull after the holidays. 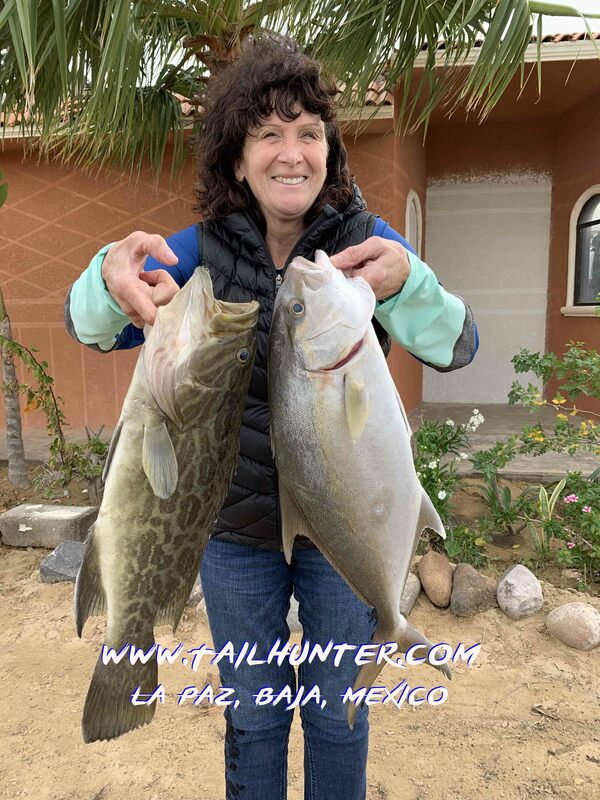 It’s hard to get a true assessment of fishing if there’s not that many folks getting out, but then again, there aren’t that many visitors and vacationers in the city to begin with. 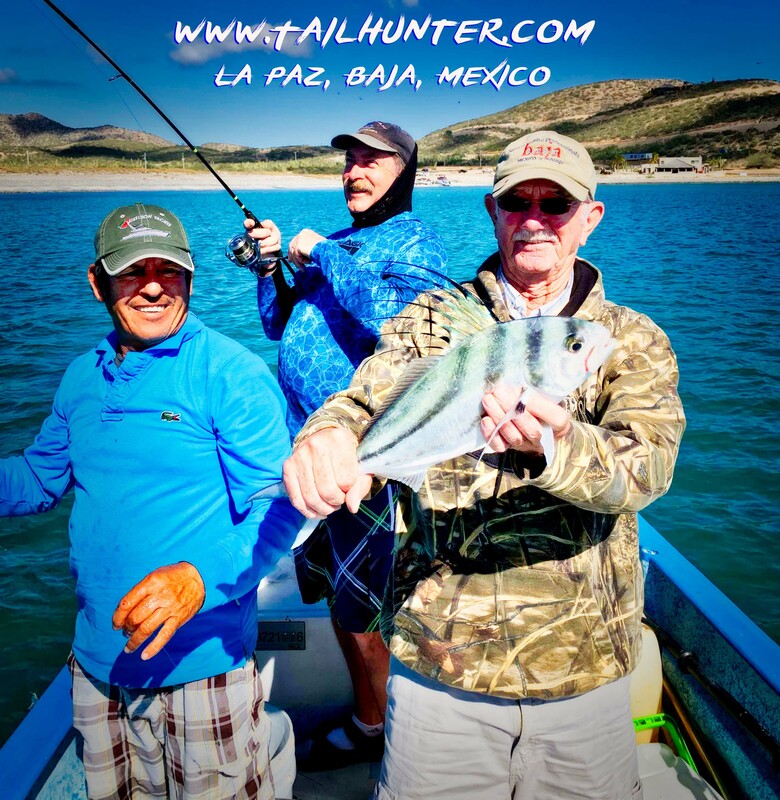 Over the reefs and rocky areas, cabrilla and yellow snapper put the bend on the rods plus bonito, sierra, jack crevalle and some smaller firecracker yellowtail and smaller amberjack. Enough to keep folks happy and some good action. This coming week looks a little cloudy and there’s even a chance of some rain with wind getting stronger and gusts to 25 mph later in the week. The temps looks like they’ll run from the mid-50’s to 70’s. Our 20-year-old Tailhunter website needed a re-model and facelift! After more than a year of work, we’re excited to announce that our new and improved Tailhunter website is up and rolling! We think it looks great. It’s sleeker, faster and turbo-charged easier to use and more friendly for social media, cellphones and pads! It still has a few little bumps here and there that need to be fine-tuned and we’re still adding more to it, but we’re ready to go! Thanks to AQGraphics and Jaime Laureano for all his work and patience and spearheading all the months of effort. We just wrapped up an incredible week at the International Sportsmans Show in Denver, Colorado. We had four fantastic days in our booth and it was great to see so many amigos who stopped by to say hi and meet many more new ones. Thanks to everyone who booked trips for 2019 and there were ALOT of you. We’re excited to have you come visit and we’re looking forward to seeing you in La Paz! 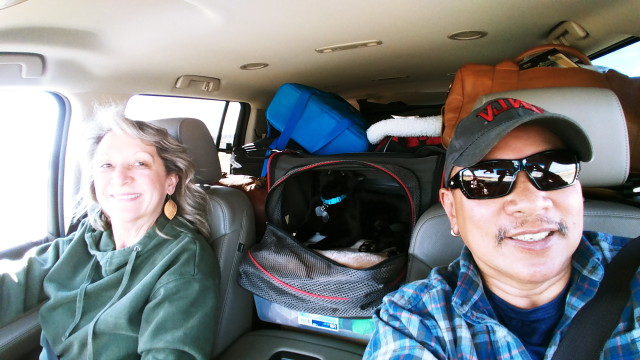 Now, we jump in our Tailhuntermobile and rumble back west through Wyoming, Utah, Nevada and back to California! 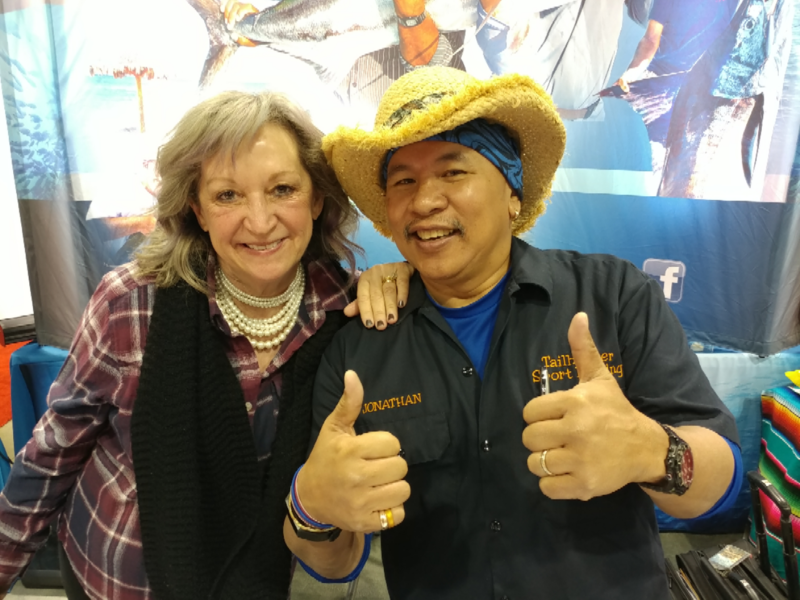 From Thursday to Sunday, we’ll be at the Cal Expo Fairgrounds in SACRAMENTO for the ISE Show which is the largest fishing and hunting show in Northern California. I hear there are over 700 booths and vendors this year from everywhere from Africa to Canada and Alaska to South America!